Scones are the perfect accompaniment to afternoon tea either an adult luxury tea or a cozy tea with the kids, all that is needed is a log fire. 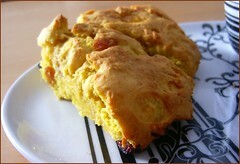 Scones are best eaten warm from the oven and if you must keep them until the next day they are best toasted. They are also best if handled very quickly, don't labour the shaping of them because to get light and airy scones you do not need to activate the gluten in the flour. Beat egg with sugar and add sugar and pumpkin.Sift flour, baking powder and salt and add to the wet ingredients. Add raisins and orange peel. Be careful not to over mix. Shape dough into a circular shape about half an inch thick, either cut the dough into small shapes with a glass or cut the top half of the dough eight. Preheat the oven, bake at 375°for about twenty five minutes.